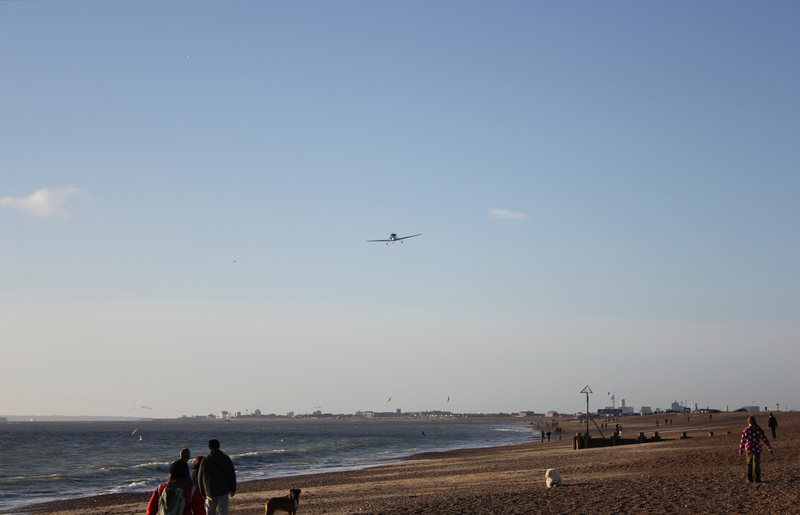 As we strolled along Hayling Island beach we got buzzed by a low-flying aircraft – look out! Here it comes for another pass! For a good 20 minutes or so this aircraft circled over the beach. It would approach from the east and then dive down, almost as if to strafe us. It must have been only a couple of hundred feet above us. It would tear along the beach and then peel off, pulling up and flying out to sea, eventually disappearing into the distance. A few minutes later we would hear the drone of its engine as it reappeared in the east again, lining up before diving down for a second run. This aircraft buzzed us successfully – we were truly buzzed! Look out! Here it comes again! This entry was posted in Hampshire, Islands and tagged aircraft, beach, coast, Hampshire, Hayling Island, travel, walking. Bookmark the permalink. Not so, RH! I was disappointed when, after his last pass, he flew off into the distance and did not return. That is an exciting sky scene! Thank you! It was good fun (and not a little difficult) to make.